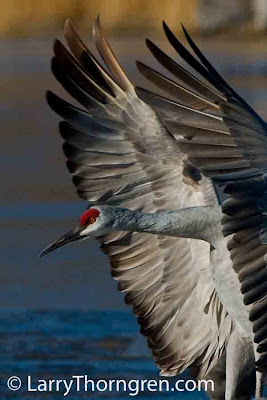 This Sandhill Crane has just touched down as it lands on a pond in New Mexico. The crane landed too close to me to get the entire bird in, so I cropped the image to get this look. Sandhills fly at great altitudes. I sometimes can hear them, but have to use binoculars or a large telephoto to see them circling high overhead.